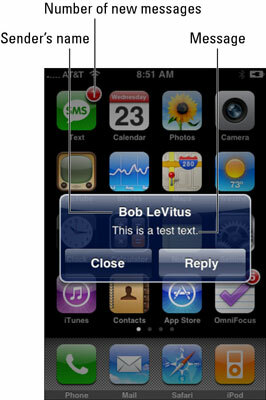 When you get an SMS text message on your iPhone, you can read and reply to them. The way you do this depends on whether your iPhone is asleep or awake. If you receive an SMS text message when your phone is asleep, all or part of the text message and the name of the sender appear on the Unlock screen when you wake your phone. You see this if your iPhone is awake when an SMS text message arrives. If your phone is awake and unlocked when an SMS text message arrives, all or part of the message and the name of the sender appear on the screen in front of whatever’s already there, along with Close and Reply buttons. At the same time, the Text icon on the Home screen displays the number of unread messages. To read or reply to the message, tap Reply. To read or reply to a message after you’ve tapped the Close button, tap the Text icon. If a message other than the one you’re interested in appears on the screen when you launch the Text application, tap Messages in the top-left corner of the screen, and then tap the recipient’s name; that person’s messages appear on the screen. 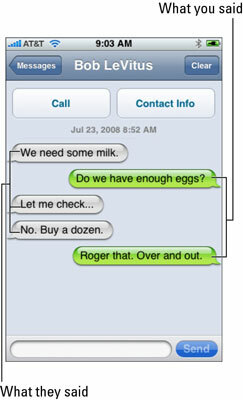 This is what an SMS conversation looks like. Your conversation is saved as a series of text bubbles. Your messages appear on the right side of the screen in green bubbles; the other person’s messages appear on the left in gray bubbles.